Chili from Ben’s Chili Bowl in D.C.
Brunch at the Army Navy Club in D.C.
Oysters and Yuengling at the Old Ebbitt Grill in D.C. Sounds like I’ve got my priorities straight, right? My memories have always been punctuated by food- what I ordered when we went here or there, what we ate the day that this-or-that happened, what so-and so cooks so well. 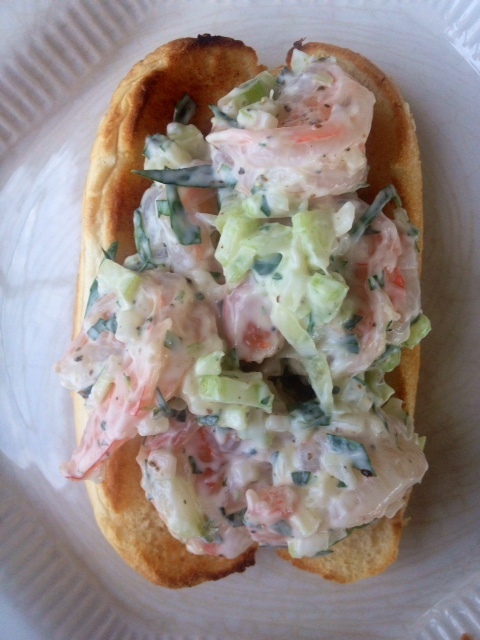 Today’s recipe is an approximation of one of the dishes on my list- the lobster roll! My OCD prevents me from trying this recipe with lobster- I’m holding out for the real thing in the right place- so I used shrimp. Didn’t heat up the kitchen too much and loved every bite. Bonus recipe below for a cooling summer smoothie! Bring a pot of water to a boil. Add the Old Bay seasoning, the lemon, and the peppercorns. 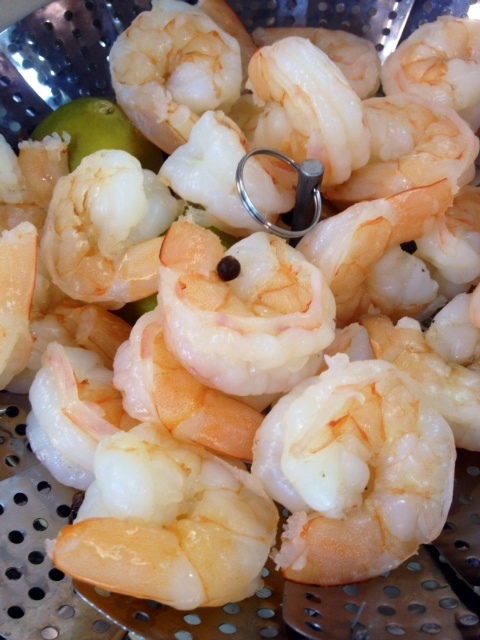 When the water is boiling, add the shrimp and boil 2-3 minutes, until opaque and cooked through. Strain and set aside, tossing the lemon and peppercorns. I recommend chilling the shrimp for a while to bring to room temp or cooler. Meanwhile, dice the onion, celery, and tarragon. When the shrimp are cool (or warm, your call), toss the veggies and tarragon with the mayo, a sprinkle of celery seed, and some cracked black pepper. Fold in the shrimp and taste for seasoning. Toss all ingredients in a blender a whir away. Serve over ice. Crazy straw optional, but recommended. Would be quite tasty with a bit of coconut rum… Hmm. Rum is good for pondering. Sip your smoothie, ponder, and tell me…. What have YOU checked off of your culinary bucket list? What’s left to be tasted? This entry was posted in Classics, Dinner, Easy, Fancy, Fast, Fish & Shellfish, Healthy Spin, Pescatarian, Vegan and tagged culinary bucket list, foodie bucket list, shrimp rolls, watermelon drink, watermelon smoothie. Bookmark the permalink. Your shrimp rolls look delicious! The Maine Lobster roll is a curious beast. Completely different at each place and yet, a geographical/culinary staple of Downeast. When you do go to Maine, plan a lobster roll tour. That’s how it should be done… assuming you really love mayo. Speaking of tours – I think a bread pudding tour is in order in NOLA. Every restaurant that’s worth their salt has it and me, oh my, that would be my last meal. Shrimp creole, fresh berries, bread pudding, shoo-wee. Shoo-wee, indeed! I am all for a) mayo, b) bread pudding tours, and c) blog hops!! I gain 5 pounds every time I go to NOLA and every ounce is worth it. Your last meal sounds FABULOUS. I’ll post my photos on the blog hop next week!